The global brine concentration technology market was valued at nearly US$ 12 Bn in 2017 and is anticipated to expand at a CAGR of more than 4.0% from 2018 to 2026, according to a new report titled ‘Brine Concentration Technology Market - Global Industry Analysis, Size, Share, Growth, Trends, and Forecast, 2017-2026’ by Transparency Market Research (TMR) Growth of brine concentration technology is highly dependent on oil & gas activities. The shift toward clean energy is expected to drive the demand for brine concentration technology in the near future. Brine is a salt water solution, which may contain different salts such as calcium sulfate, silica, calcium chloride, and sodium. Brine needs to be treated before discharging it into the environment. Brine concentration technology involves treating the produced brine to remove harmful salts from the water. Oil & gas exploration is a major source of energy in many countries. Its production has been described as one of the most important industrial activities of the 21st century. Water is a complex mixture of organic and inorganic compounds and the largest volume of by-product generated during oil and gas recovery operations. The oilfield produced water can be a source of fresh water for water-stressed oil-producing countries. Extraction and production of oil & gas leads to reduction in reservoir pressure. Additional water is usually injected into the reservoir water layer to maintain hydraulic pressure and enhance oil recovery. Increase in concern about the environment has played a major role in the adoption of brine concentration technology. Various projects, including several para-xylene chemical plants in China and a wastewater discharge pipeline for a paper mill, have been suspended or canceled as a result of public protests. Growth in concern about the environment is likely to compel industries to adopt brine treatment as a necessary solution in order to gain public acceptance. High installation cost of brine concentration technology can be a restraining factor, specifically for small industries that have lower capital investment. In terms of technology, the vertical tube falling film (VTFF) segment currently holds the major share of the market due to the technology’s application in achieving zero liquid discharge in industries. Development of offshore oil & gas industry in North America and Middle East has propelled the demand for HERO technology. The HERO segment is likely to expand at a CAGR of 6.39% during the forecast period, followed by the VTFF segment (CAGR of 5.57%). MVC and CCD segments are also anticipated to expand during the forecast period. In 2015, Desalitech and C2HM together emphasized on developing the Closed Circuit Desalination (CCD) technology. The CCD technology improves the efficiency and productivity. It helps in passing concentrated brine through the system continuously and leaving the salt precipitate behind through salt extraction gate. The new technology helps tackle issues arising due to depleting amount of freshwater for domestic and industrial purposes. Installation of brine concentration plants enables industries to reuse the recovered water and thus lower their operating costs. Asia Pacific is estimated to emerge as one of the prominent regions of the brine concentration technology market. Highly environment-conscious Europe and North America are projected to lead the global brine concentration technology market in the near future. The brine concentration technology market is projected to witness a large number of collaborations among manufacturers and technology developers during the next few years. Over the years, China has become a strategic center for brine concentration technology. This is projected to boost the demand for brine concentration technology systems in Asia Pacific in the near future. The global brine concentration technology market is a highly competitive. 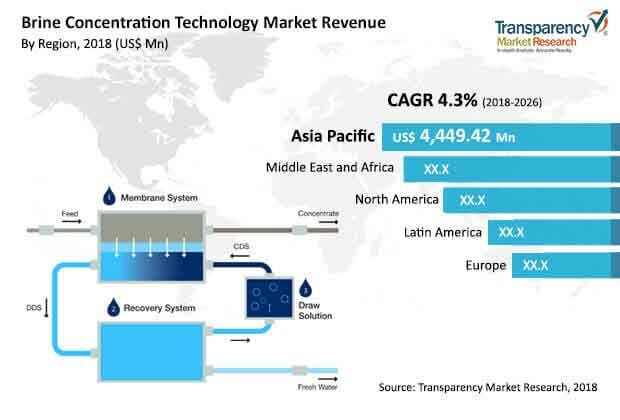 In order to acquire higher market share, companies operating in North America, Middle East & Africa, and Asia Pacific are rapidly expanding their production facilities of brine concentration technology. Leading players dominate the market. Key players operating in the brine concentration technology market are Advent Envirocare Technology Pvt. Ltd., Modern Water plc. Memsys Water Technologies GmbH, Enviro Water Minerals Company Inc., Oasys Water, TETRA Technologies, Inc., Fluid Technology Solutions, Inc., Osmo Membrane Systems GmbH, Saltworks Technologies Inc., Duraflow LLC., Veolia, and Synder Filtration, Inc.